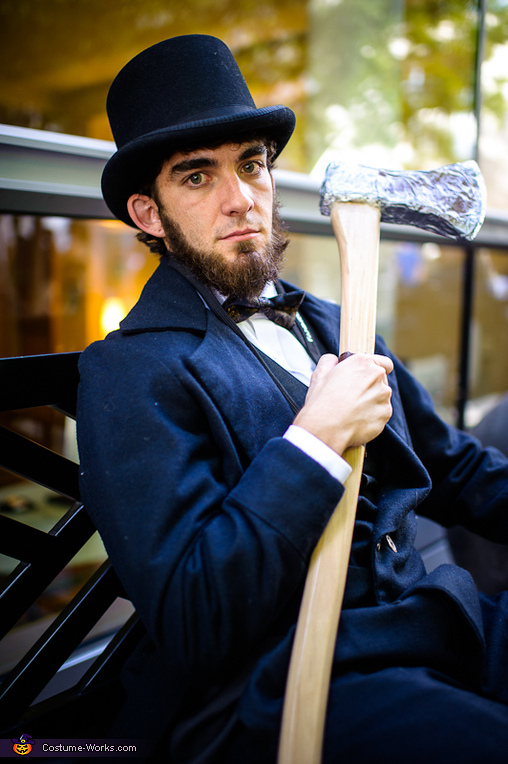 I got the idea from the book Abraham Lincoln: Vampire Hunter. Most of the clothing I just found at used/vintage stores, but I made the axe my going to Home Depot, getting a wooden axe handle and some insulation foam (the type that you spray into cracks and it hardens), then sprayed into a box, stuck in the axe handle, and let it sit overnight. The next day I carved the now-hard foam into the shape of an axe head and covered it first in this super metallic tape, then just normal duct tape, leaving the "edge" and other small parts of the head exposed to try to mimic the sheen of metal. Then I sprayed some brown spray paint on the head for dried blood/rust. Kaylin, I listed the instructions up above.